The grapes are ripening on the vines, the boats are bobbing on the tide in the harbour, the wind is blowing like a gentle breeze through the sails in the windmills, butterflies and bees make their way in and out of brightly-coloured flowers on the bushes on the roadsides, and in the early evenings, as I look west along the beach at Platanes towards Rethymnon and the Fortezza that crowns the old Venetian town, the sun sparkles on the water and the waves, turning the surface of white, blue, turquoise and red-wine into a silver sheen. 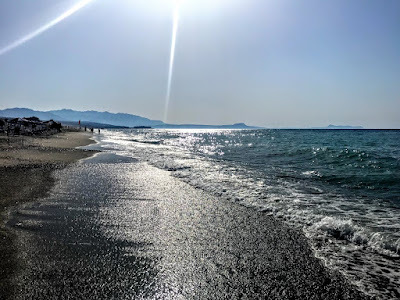 But my week in Rethymnon has come to an end, and I am preparing to move on later this morning, further west along the coast towards Chania, to spend my second week in Crete in Georgioupoli, just 22 km west of Rethymnon. 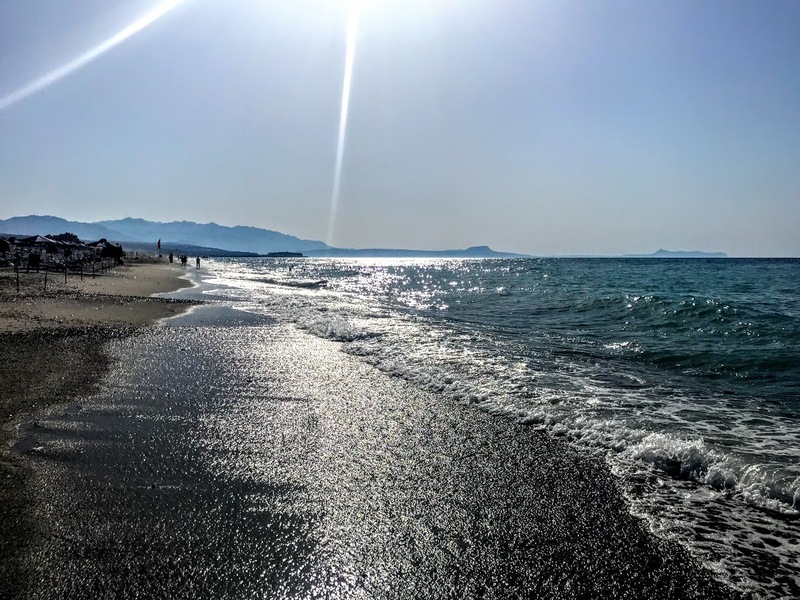 I have spent the past week in Varvara’s Diamond Hotel, just a short walk from the long, sandy beach that stretches for miles east of Rethymnon, almost as far as the eye can see. 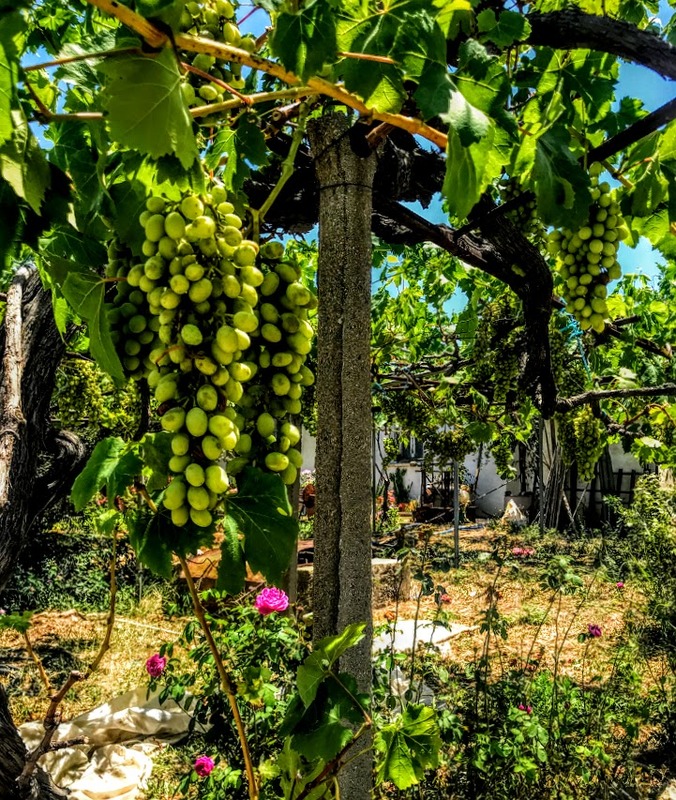 Once again, I have been welcomed back – occasionally I have even been welcomed home – in a part of Greece I have known since the 1980s. Last night, two of us walked up to the neighbouring village of Tsesmes, to marvel at the sunset to visit friends at Pagona’s Place, before returning to Platanes for a farewell dinner in Finikas Taverna before moving on. 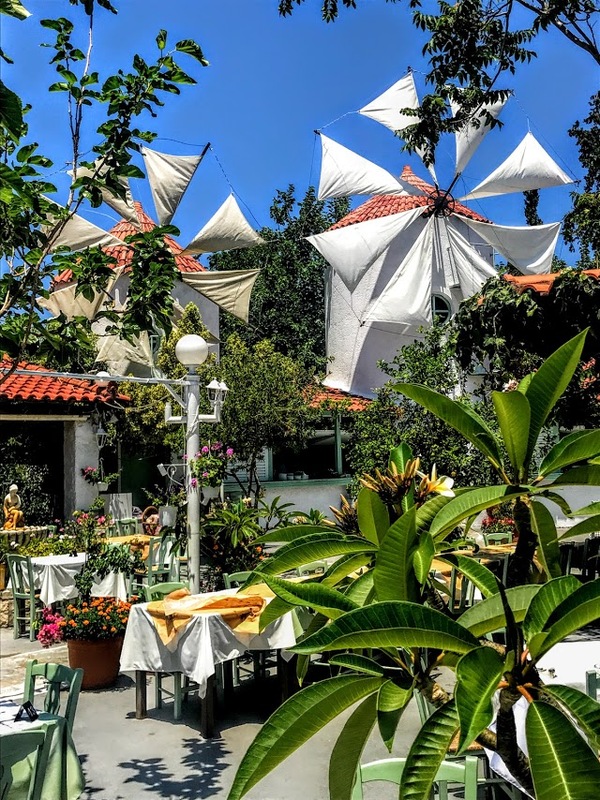 The food in tavernas and restaurants here, like Finikas Taverna in Platenes and Pagona’s Place in Tsesmes. 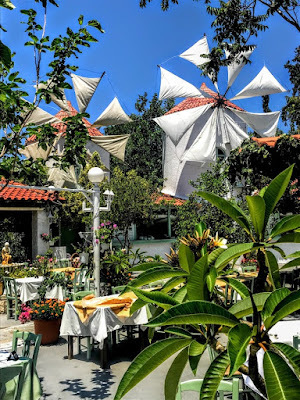 is a reminder that the unique cuisine in these suburbs of Rethymnon was brought here by Greek-speaking refugees fleeing the ‘ethnic cleansing’ that swept through western Anatolia in the first decades of the last century. Throughout the cities of Crete – Chania, Rethymnon, Iraklion and Aghios Nikolaos – it is easy to find the names of villages and suburbs, family names over shops and tavernas, or the names of saints evoked in new-built churches that are reminders of those refugees who found a welcome here after they fled the murders and violence instigated by Ataturk and his Young Turks in the early 20th century. As we walked up to Tsesmes in the late evening sun, I realised that one of those reminders is in the name of Nikomidias Street. The Emperor Diocletian chose the ancient Greek city of Nicomedia (Νικομήδεια), now known as İzmit, as the eastern and senior capital city of the Roman Empire in 286. The city retained this status until 330, when the Emperor Constantine moved the capital to Byzantium, which he renamed Constantinople and is known today as Istanbul. The 20,000 Martyrs of Nicomedia were victims of the persecution of Christians in Nicomedia by Diocletian and Maximian in the early 4th century. These persecutions included burning a church with many Christians on Christmas Day. The Emperor Maximian had returned to Nicomedia after his victory over the Ethiopians in 304 AD. But the city’s Christians refused his command on Christmas Day to sacrifice to idols during the Christmas Mass and give thanks to the Roman gods for the emperor’s victory. Maximian forced his way into the church with his soldiers entered and told the Christians they could escape punishment if they renounced Christ. The priest, Glycerius, told him that Christians would never ‘renounce their faith, even under the threat of torture.’ Maximian was angered ordered him to be burned to death. Those who were not burned in the church were captured and tortured to death. Bishop Anthimos, who escaped from the church, was captured and was beheaded. The martyrs of Nicomedia continue to be commemorated on 28 December in the Orthodox Church. In the early 20th century, Nicomedia or İzmit was the seat of a pasha, a Greek Orthodox metropolitan, and an Armenian archbishop. The Ottoman government launched a policy of ‘ethnic cleansing’ in many areas, including Izmit, in 1915, and ordered the mass deportation of the local Greek and Armenian communities. That year, the New York Times reported that 19,000 Greeks had been uprooted from their homes in Izmit province and driven to purely Turkish districts. The Armenian Archbishop, Stephan Hovakimian, said that of the 80,000 Armenians in his diocese, 70,000 had been lost in exile, falling with hunger and exhaustion during their long marches, and men and women were slaughtered as they arrived at their destinations. British troops entered the city on 6 July 1920, but left on 27 October 1920, handing it over to Greece. At the time, British reports said the city had a population of about 13,000 people. Meanwhile, on 27 August 1920, large bands of armed Turkish nationalists, led by a Djemal (or Cemal), surrounded the Greek quarter of neighbouring Iznik, seized the entire population of 600, and massacred them. No survivors were found. But by the early summer of 1921, the retreat of the Greek army was imminent. The Christian population of Nicomedia or İzmit was panic-stricken and they feared a wholesale massacre by Ataturk’s bands. About 22,000 people had fled to the city and sought refuge there while the Greek army was present. In addition, about 10,000 Greek and Armenian inhabitants feared the arrival of Turkish nationalists. According to a British report, 33,000 people were evacuated. They included about 21,000 Greeks, 9,000 Armenians and 3,000 Turks and Circassians. But Greek reports said 32 villages were looted or burned, more than 12,000 local people were massacred by Turkish forces, and 2,500 people were missing. Homes were burned, churches were bombed or set alight, shops and businesses were looted. 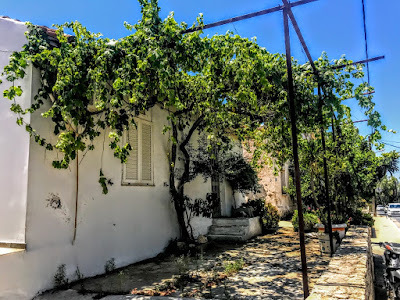 In the village of Fulacık (Φουλατζίκ), 300 men and boys aged 14 and older were locked inside the church of Saint George before it was doused with petrol and set alight. Many of the people living in Tsesmes today are the grandchildren and great-grandchildren of those survivors who fled the massacres in Çeşme, Nicomedia, and other parts of Anatolia almost a century ago and found safety and refuge in this beautiful suburb of Rethymnon. But the name of Nikomidias Street and the waters of the Mediterranean that we have enjoyed for the past week are reminders of how we have learned little from these events over the past century and continue to create new martyrs of modern Nikomidias, as refugees are left to their own devices or abandoned in the Mediterranean.